SAIL MAIL: Day Sails, Deck Tours, Guest Crew Adventures and More! Summertime is when Pride of Baltimore II shines brightest! Pride is docked for the summer at the Constellation Pier in Baltimore’s Inner Harbor – have you been out to see us? We are offering free deck tours as well as day sails and sunset sails nearly every weekend. We are also hosting what promises to be a fascinating book discussion about Privateers in September. And, we have an opportunity for an overnight sailing adventure later this month. Read on for more, and see you aboard! A deck tour is the ultimate way to explore our ship, learn about its special place in history, and what made it unique in the War of 1812 and today. Stepping aboard Pride is literally like stepping back in time. Pride will be open for deck tours in Baltimore’s Inner Harbor on most weekends through September. Please see our website for dates and times. Join Us for a Sail! Sailing with Pride is an experience you’ll never forget! Pride sails from the Inner Harbor into the Patapsco River, past Fort McHenry and near the Key Bridge, just like Francis Scott Key did during the War of 1812. If the conditions are right, we can catch some beautiful wind. With her sails unfurled, Pride is a sight to behold. 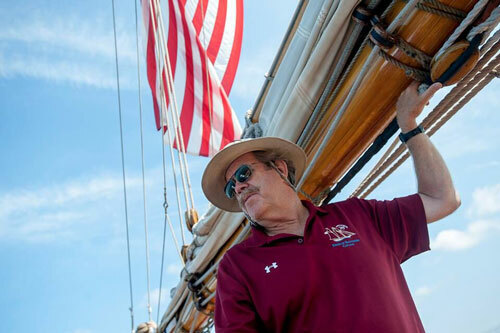 On board, guests enjoy the fascinating history of Baltimore’s harbor and the role it played in America’s ‘Second War of Independence.’ You’ll hear about the “Star-Spangled Banner” and the ‘Bombs Bursting in Air’ as we pass Fort McHenry. You’ll also see the thriving seaport of present-day Baltimore and hear about the city’s successful commercial industry. And you’ll learn more about Pride herself, from her inspiration 200 years ago to the wizardry of her construction as a wooden sailing vessel, to the tragic event that caused an entire city to unite together and create the ship we know today as Pride of Baltimore II. Our tours last 2 hours, which is nearly twice as long as other boat tours in the Inner Harbor. So what are you waiting for? We are offering a limited number of day sails and sunset sails this season – see below for our complete schedule, and get your tickets today! We’re partnering with the Maryland Historical Society to bring you an afternoon of historic proportions – all about privateers! On Sunday, September 20, author David Head will lead a fascinating discussion about his new book, Privateers of the Americas (publish date: October, 2015). After the book talk, we’ll board Pride for a two-hour sunset sail around Baltimore’s Inner Harbor, complete with dessert and coffee! This event is co-sponsored by the Maryland Historical Society Maritime Committee and Pride of Baltimore, Inc.
Free street parking is available on Boston Street. A paid parking lot is available between 7-Eleven and the shop, Boston Street Running. Privateers of the Americas book talk is $20 for non-Members and $10 for Privateer Society Members. Register for book talk here. Sunset Sail is $60 for Privateer Society Members and $75 Non-Members. Register for sunset sail here. Join Us For A Guest Crew Adventure! Come aboard Pride of Baltimore II for a multi-day trip in the northern Chesapeake Bay, from Sunday, August 23 through Wednesday August 26! We will be sailing where the wind takes us, charting our course for the optimal sailing experience. As part of our Guest Crew, you’ll be working alongside our professional crew and taking an important role in running the ship! You will participate in sail handling, take turns on the watch (and learn why that’s so important), spend time at the helm, conduct the boat check, navigation activities and more. Pride will sail where the wind takes her, charting her course for the optimal sailing experience in the beautiful region of the Northern Chesapeake. So book your bunk today, then pack your bag for a great sailing experience on Pride! We can only take six guest crew, so early applications are a must. Apply today on our website. Host a Private Charter Aboard Pride! Even when she’s not sailing, Pride of Baltimore II provides an exclusive way to entertain clients, customers, employees, or friends. The vessel’s sleek hull, raked masts, and intricate rigging provide a dramatic setting for any occasion. The vessel can be chartered for a or dockside reception here in Baltimore. Or she can be taken on a sailing voyage into the Inner Harbor. Pride, Inc. staff and crew will work with you to make your event truly unique – leaving an unforgettable impression on your guests. -And more. The possibilities are endless! Per U.S. Coast Guard regulations, the number of guests for a dockside reception is limited to 100 on the vessel; more if shore facilities are available. Sailing charters can accommodate 35 guests. Contact us to learn more. *Pride II welcomes visitors with limited mobility; please contact the Pride office in advance.